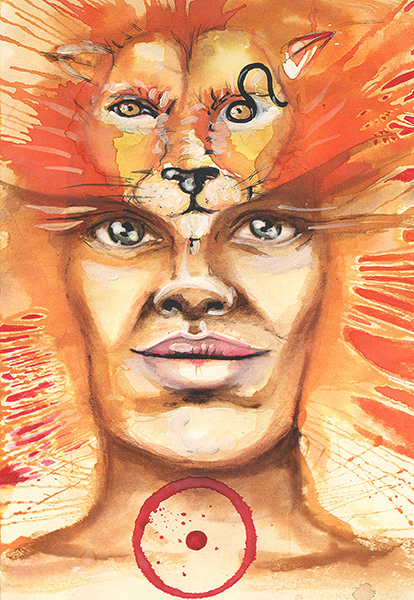 Leo gives people who were born under this sign healthy self-esteem and natural authority. They have the power to dominate and control others, but they are generous and friendly. These people usually do not have any doubts about themselves, because they believe in their work and moral qualities, and they are also able to trustingly assess their counterparts. They are proud people who also respect the pride of their fellow citizens. Others like them for their directness and openness. Knightliness and tact are their innate characteristics. In their presence everybody feels well and nobody minds to conform to their leadership and decision-making, because these people exude calm dominance and they are never narrow-minded. People born under this sign like wealth and high standard of living, but even in bad material situations they do not lose their confidence and they do not let others see by their appearance or behaviour that they need help or sympathy. Princely sign Leo causes that these people, whatever social class they belong to, would radiate natural elegance, even if they were forced to wear rags. This is caused they their gait and posture, but mainly by their noble behaviour. In bad illumination of their Sun by other planets it may happen that their pride turns into immodesty and their authority into arrogance. Then they might start to impose their will at the expense of others and use it not only by their direct "leo" way, but also in a malicious backstabbing way, and they will do it until they get what they want. People born under the sign of Leo will always select the shortest path to the destination and they are equipped with great determination. They thrive best in free professions where they can be independent, but the business sector is also suitable for their mentality, because they can put their courage and joy of taking a risk into use. Just like all felines, lions also have the ability to react fast and they can successfully manage confusing situations in which they can take advantage of their infallible instinct and fast reflexes. These people are successful in any profession in which they can use their good manners, wits, tact and confidence. While they are able to do well any job, they are unbeatable diplomats and politicians.